More than 20 years ago, G. Sanford McGee went looking for piece of copper he'd stowed a few years earlier on the edge of his yard while working on building his off-grid home near Sewanee, Tenn. McGee, a science teacher, naturalist and artist, was finally ready to begin the copper-faced architectural frieze he had planned for his new home. After locating the copper panel and pulling away the accumulated layers of plant and leaf decay, McGee met with an epiphany. 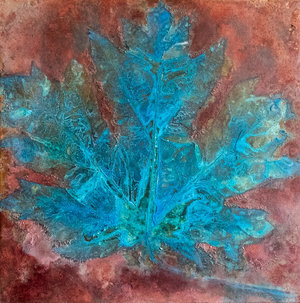 The hand of nature had taken over, adding layers of patina to the copper -- colors and forms telling the story of the particular leaves, plants and their chemical components interacting with the copper sheet. Another home-builder might have considered the copper ruined for their purposes. But, McGee, with his artist's eye, understanding of chemistry, and deep knowledge of the plants of his native Cumberland Plateau was uniquely prepared to recognize and appreciate the opening of an artistic collaboration with nature. In the intervening years McGee has continued the dialogue between his artistic practice and the natural world. These sublime yet highly physical works have been enthusiastically received and are exhibited across the U.S. including gallery shows in Santa Fe, Colorado and Tennessee. His commissioned works and other pieces are held in collections across Europe and the U.S. In the coming weeks, McGee's work will be featured in the SAS Gallery along with another artistic collaboration: Annie Hanks Ceramics Studio of Chattanooga, Tenn., the joint project of Stephanie Anne Martin and Katherine Hanks. Their utilitarian and sculptural bodies of work combine a contemporary aesthetic with timelessly simple forms. Matte finishes and pale neutral colors predominate, adding to the elemental character of their porcelain and stoneware. The surfaces call to mind rocks and bones, with occasional spare strips of colored glazes evoking horizon, sky or landscape. Hanks, a Texas native with a lifelong affinity for the natural world, recognizes the influence of her native Hill Country landscape on her Annie Hanks work. Meanwhile, Stephanie Martin's connection to clay is more inwardly-focused; she describes her ceramic work as a manifestation of internal growth into tangible form. In the five years since its founding, Annie Hanks Ceramic Studio has flourished, with its functional work featured in Scenic City Supper Club and Wildflower Tea Shop in Chattanooga, a recent exhibition of sculpture, and both artists being featured in the Hunter Museum of Art's popular Examinations project. Annie Hanks Ceramics & G. Sanford McGee's works on copper can be seen in the SAS Gallery on the campus of St. Andrew's-Sewanee School through March 5. There will be a public reception for the artists on Saturday, February 9, 4-6 p.m. The SAS Gallery is located in the center of Simmonds Building on the St. Andrew's-Sewanee School campus at 290 Quintard Road, Sewanee, TN. Hours are Monday through Friday, 9 a.m.–3 p.m., and by appointment. Contact Gallery Director Julie Jones at sasgallery@sasweb.org for more information.